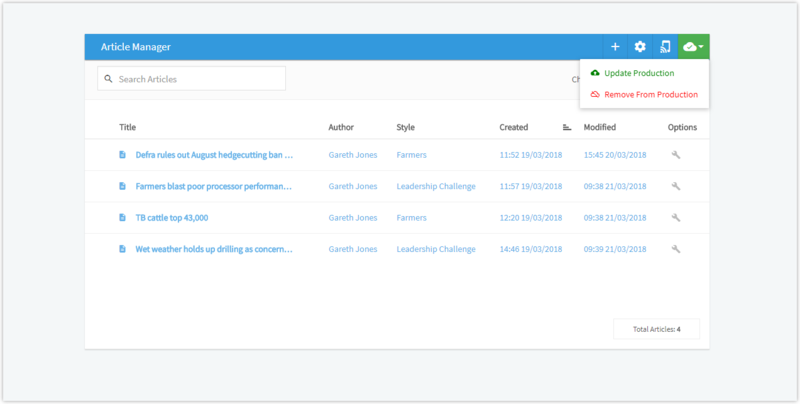 If your Canvasflow account is configured to use a Pugpig staging app, you have the ability to push changes to the staging app independently of the production app. This is a simple way to allow proofreading before committing changes to your production app. From the article manager, click the update dev button. Click ‘Update’ to commit the changes. The staging content source will be updated. To see the changes in your staging app you must update the staging content source in the Pugpig distribution service. No changes will appear until the staging content source update is completed in the Pugpig distribution service. When the update dev button is clicked, a snapshot of the current issue including all assets, articles and metadata will be taken. This snapshot is then used as the source for your Pugpig staging app. Once your issue is complete, it's ready to be sent to production. When an issue is sent to production, a snapshot of the current issue, including all assets, articles and metadata will be taken. This snapshot will then be used as the source for your Pugpig production app. From the Article Manager, click the 'Send to Production' button. The Production content source will be updated. 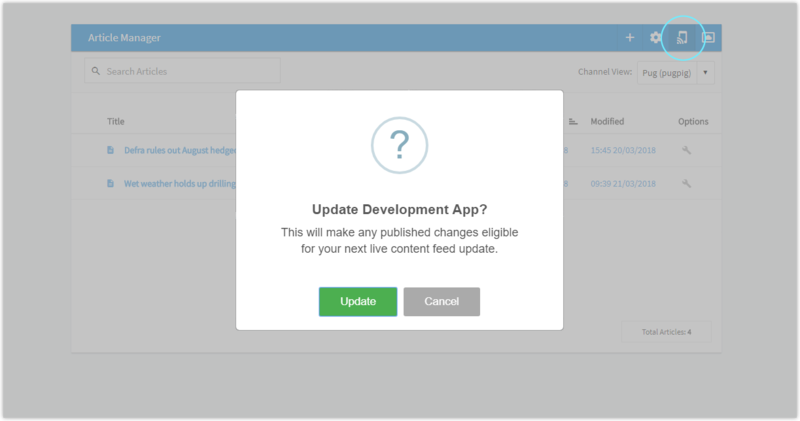 To see the changes in your production app, you must update the ‘production’ or ‘live’ content source in the Pugpig distribution service. No changes will appear until the content source update has completed. If you need to push changes to an issue that has already been sent to production, this can be done by ‘ Updating Production’. From the article manager, click the green ‘Send to Production’ button, a drop menu will appear. Update the 'Production' content source in the Pugpig distribution service. Please note that no changes will occur until the production content source update has completed. From the article manager, click the green 'Send to Production button', a drop menu will appear. Update the 'Production' content source in Pugpig distribution service. Please note that no changes will occur until the production content source update has completed in the Pugpig distribution service. 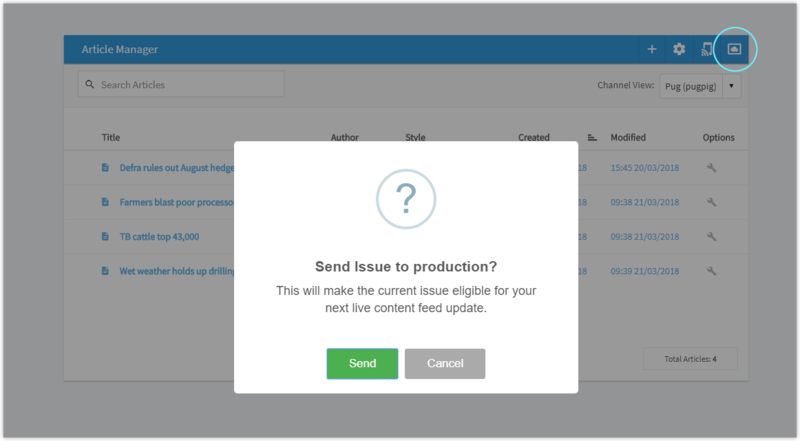 It's also possible to Send, Update and Remove an issue from production from the Issue Manager. The 'production' control button can be found at the bottom right of each issue.